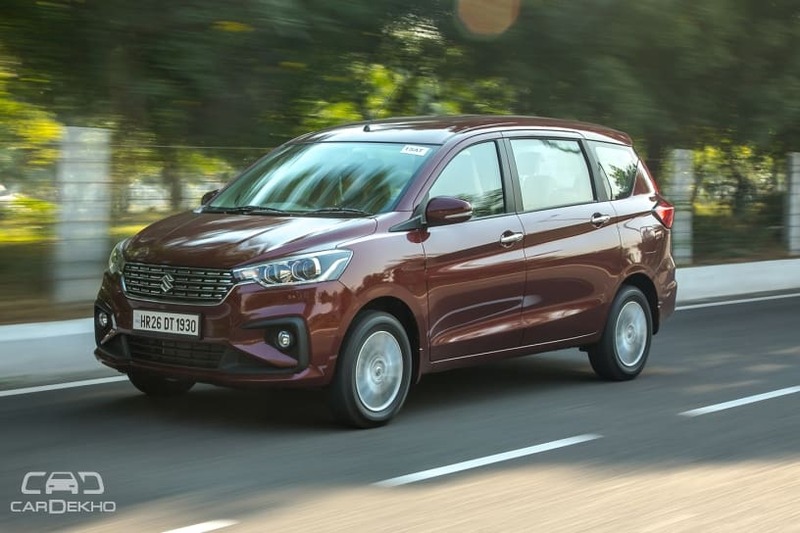 Maruti Suzuki overhauled the Ertiga in 2018 in every imaginable aspect from its platform to engines and features. Here’s how it stacks up against the first-gen model. Maruti Suzuki Ertiga Old vs New - Which One Offers More Space? The second-gen Ertiga looks muscular and bold in comparison to the first-gen model. Its bonnet looks comparatively higher than before, like an SUV and a flatter profile of its grille and bumper compliments it upright stance. The headlamps are sleeker than before and have a dual-barrel setup with halogen projectors. The new Ertiga also looks wider than before which is partly due to its new muscular design and increased overall width compared to the previous model. The 99mm increment in length is visible post the C-pillar as the new Ertiga gets a noticeably larger rear quarter glass. It also makes the third-row comparatively airier. There’s a single character line that runs across the length of the MPV as before. The new Ertiga runs on 15-inch alloys (185/65 cross-section tyres) same as the old model. The redesigned rear profile of the Ertiga looks quite Honda-like, especially with the new LED tail lamps that reminds us of the upcoming fifth-gen Honda CR-V. Nevertheless, the rear profile compliments the front with its prominent lines and muscular appearance. The rear quarter glass merges with the rear windscreen to impart a floating effect to the roof. This time around, the Ertiga does not borrow its dashboard from the Swift and the Dzire. It shares several parts, though, such as the flat-bottom steering wheel and the air conditioning panel. Its cabin continues to feature the same grey and beige theme as before, while there’s a central black panel that houses air vents accompanied by a width-spanning faux wood insert. Adding a hint of premiumness are the AC vents that seem to be inspired from Audi’s newer cars such as the A5. The twin-pod instrument cluster, driver info display on the second-gen Eritga is also new and looks largely similar to that of the Ciaz facelift. While the first-gen Ertiga was equipped with manual AC, the new-gen model gets auto climate control in Z and Z+ variants. Maruti has also given AC vents in the twin-bottle holders placed on the central console to keep the drinks chilled. The new Ertiga also gets an Ignis-like floating touchscreen infotainment system. It is the same 7-inch SmartPlay unit with Android Auto and Apple CarPlay which was available with the first-gen Ertiga. The features list of the new Ertiga includes a passive keyless entry system with push-button engine start/stop, roof-mounted vents with blower control and electronically adjustable outside rearview mirrors. For safety, it gets dual front airbags, ABS with EBD, and ISOFIX child seat anchors. The new Ertiga is also equipped with ESP and Hill Hold Control, but they are limited to the petrol automatic variants. The older model didn’t get these features in any variant. The second-gen Ertiga gets a major update under its bonnet. It is powered by the new 1.5-litre 105PS/138Nm petrol engine that debuted with the Ciaz facelift. The 1.3-litre 90PS/200Nm diesel engine, on the other hand, has been carried forward as is. However, unlike before, this time the petrol Ertiga also gets Suzuki’s smart hybrid system SHVS. While there’s a new 1.5-litre petrol engine, the transmission options have remained unchanged. And ike its predecessor, the petrol Ertiga comes with a 5-speed MT and a 4-speed AT, while the diesel Ertiga gets a 5-speed MT only. The second-gen Ertiga is priced from Rs 7.44 lakh to Rs 10.90 lakh. It is priced at premium over the first-gen model, which was priced from Rs 6.33 lakh to Rs 10.69 lakh (all prices ex-showroom Delhi). Also Read: Clash Of Segments: Maruti Ertiga Vs Maruti Ciaz- Which Car To Buy?